After several weeks of teasers and surprise-spoiling leaks, the LG V40 is now official. It is a phone made for the Android enthusiast, just like every V-series device before it, and blends powerful hardware with elegant looks. Its biggest selling point, however, is that it is adorned by no less than five cameras, including three in the back, giving you a degree of creative freedom no other phone can provide right now. 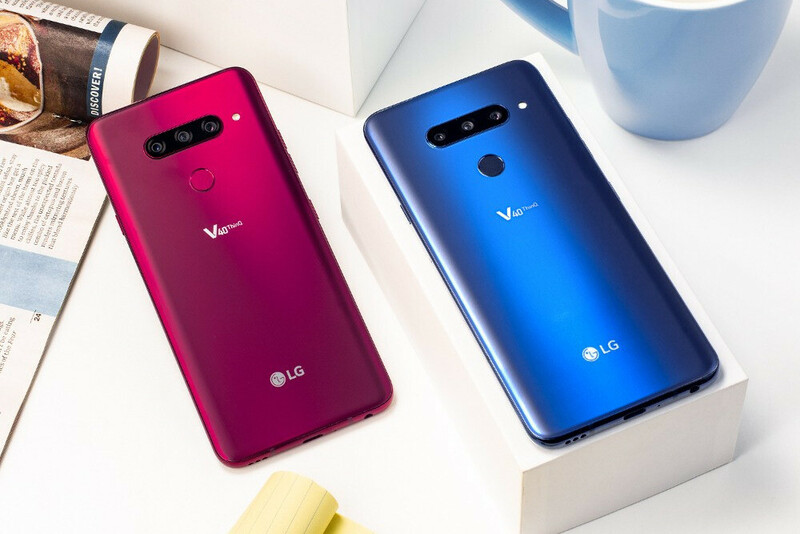 The LG V40 has a lot in common with the V30 and the V35 before it. Metal and glass are once again the materials of choice, while the IP68 water-resistance rating and military-grade drop protection certification indicate that the phone is tougher than it looks. Black and blue are the two color options coming to carriers in the US, although internationally, the phone will also come in grey and raspberry rose. What's new, however, is the inclusion of a dedicated Google Assistant key on the left side, while the fingerprint scanner at the back no longer doubles as a power key. The latter is on the right side of the device now. 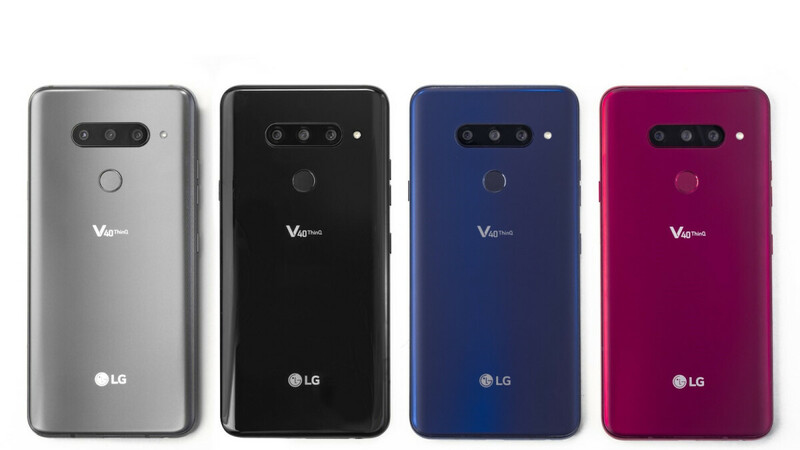 The LG V40 is taller than the V30, which comes as no surprise knowing that it also jumps from a 6-inch to a 6.4-inch P-OLED display. Its resolution stands at 1440 by 3120 pixels for a 19.5 to 9 aspect ratio and 537 ppi pixel density. This is by far the largest screen a V-series phone has ever offered. The phone is also surprisingly light, weighing 169 grams or 5.96 oz. 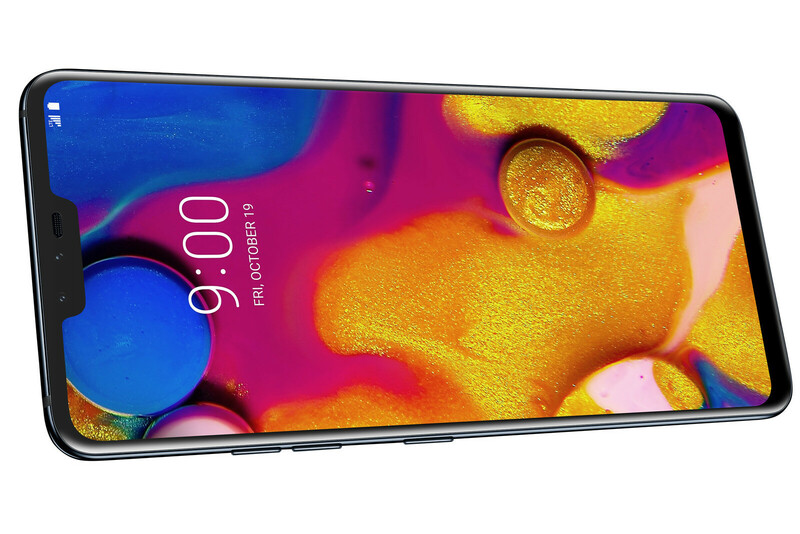 And yes, the LG V40 has a notch at the top of its display, containing the earpiece and the two front cameras. The screen area on its sides is used to display your clock, app notification icons, and device status information. Those who aren't fans of this particular design choice can "hide" the notch by applying a black background to the side screen area. The LG V40 ThinQ comes with Android 8.1 Oreo out of the box. It will be updated to 9.0 Pie eventually, but we don't yet know when. LG hasn't changed the software experience much, meaning that if you've used a recent LG phone, you'll find the V40 very familiar. As before, the UI skips the traditional Android app drawer. Navigation is performed via classic on-screen buttons instead of fancy navigation gestures. And extras we know from the LG V30, such as the Floating Bar shortcut panel, are still available. Running the show is a Snapdragon 845, which is the same chip most other Android high-end phones have under the hood. It is backed by a decent 6GB of RAM, but the 64GB of on-board storage could run out fast for those who shoot lots of photos and video. The LG V40 retains the microSD card slot for storage expansion. And now comes the interesting part. 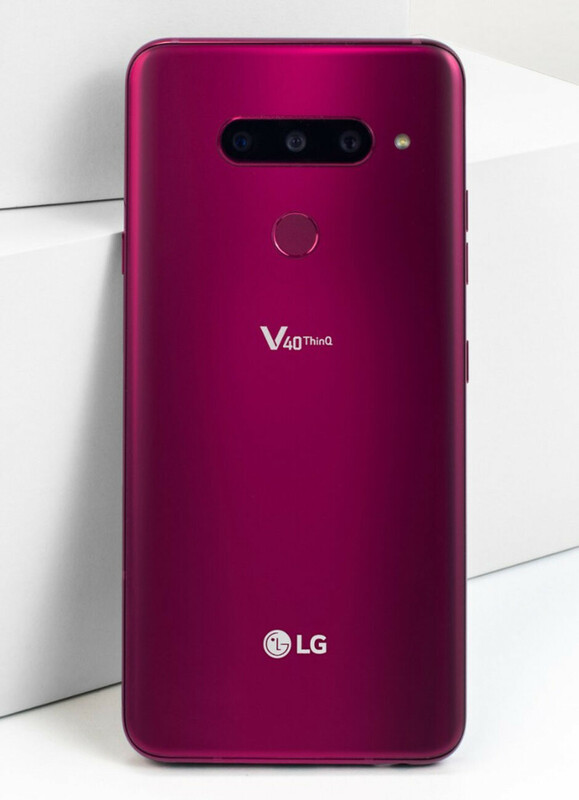 The LG V40 comes with a total of 5 cameras, which makes it one of the most versatile phones ever when it comes to photo and video capturing. At the back is a 12MP main camera with OIS, a wider, F1.5 aperture for better light sensitivity, and a larger sensor with larger, 1.4-micron pixels (vs the 1-micron pixels we had on the V30). All of these hardware improvements should translate to better image quality than before. As for the other two cameras, one is a 16MP, 107-degree wide-angle shooter like that on the LG G7, while the other is a 12MP 2X zoom telephoto camera. This camera hardware combination means that you can images from a much broader perspective without having to step back or move closer to your subject. A new feature called Triple Shot will snap three photos at once – one with each camera. AI technology is once again built into the camera software, but the enhancements go beyond scene recognition. Multi-frame HDR techniques help to bring out the best in each photo, while the shutter speed can be adjusted intelligently depending on how much movement is detected – something that should theoretically minimize motion blur. Selfies with the LG V40 can be shot with its 8MP front-facing camera, but if you need to fit more friends into the frame, there's also a 5MP wide-angle camera at your disposal. Both the front and the rear cameras support Portrait Mode for that trendy bokeh effect – which you can now adjust even after you take the shot. As other phones of its category, the LG V40 can shoot 4K video at up to 60 frames per second. What's cool is that HDR video recording is also supported and can be enjoyed on the phone's HDR-capable display. Earlier this year, LG introduced its Boombox Speaker technology with the LG G7. It is now also present on the LG V40 to boost its low-frequency output – and more dramatically so when the phone is resting on a flat surface. The trick is done by using the phone's internal volume as a resonance chamber which gives certain frequencies a welcome boost. Unfortunately, the LG V40 still relies on a single bottom-firing speaker, even though stereo speakers have been common among high-end phones for some time. And yes, LG is keeping the 3.5mm headphone jack. In fact, it is still paired with LG's 32-bit Quad DAC, capable of driving audiophile-grade, high-impedance headphones with ease. The LG V40 has a 3,300mAh battery, which is identical to the one in last year's LG V30. Our testing so far indicates that the new model should last most people through the day, but won't beat any battery life benchmarks. But at least we get a fast charger in the box. Fast wireless charging is also supported, if you have a compatible charging pad, of course. Those who choose to pre-order an LG V40 will get a free DJI Osmo Mobile 2 gimbal, as well as a 256GB microSD card. A free gimbal is a damned cool freebie! Just the battery, simgle speaker, and bloated+outdated software are my only major concerns. I've seen a few reviews and the battery is not good. The displays on the V30, V30S and V35 all had quality-control issues. The V40 uses the same P-OLED technology, so that's also a large concern in my opinion. You think your front camera quality is bad, but it could be much worse. I use an iPhone SE 16 GB as my daily driver and while the front camera does the job, it's only 1.2 megapixels (10 times smaller resolution when compared to the main camera). I must admit, LG did a good job here. No more mediocre camera sensor but let's wait for the camera reviews (not from this site definitely), to see how it stacks up from other flagships. Getting bored of the 12MP/1/2.55/2.5 sensors, they've been around for 3+ years now. I want the S10 to have a 16MP 1/2 sized sensor. I don't feel so good about v40!